The Roman road from Elah Valley passed through Horvat Hanut, and started here its ascent to Bethlehem and Jerusalem. 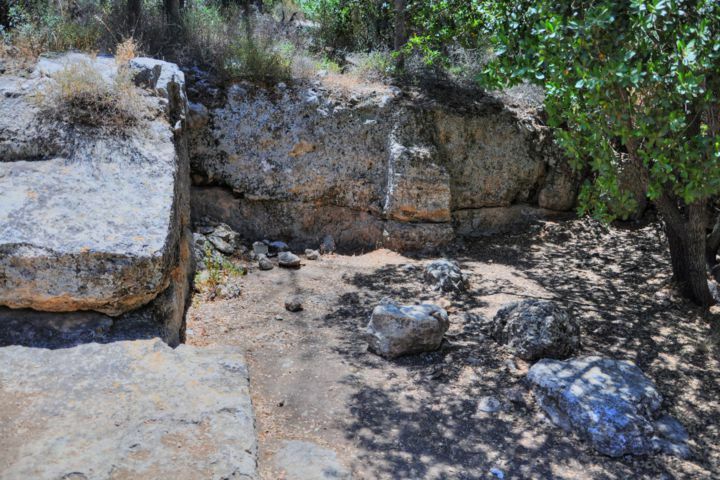 Home > Sites > Judea > Shephela > Horvat-Hanut - "Caesar Way"
The site of Horvat-Hanut ("ruins of the rest place") was a station along the ancient road ascending from the valley of Elah. 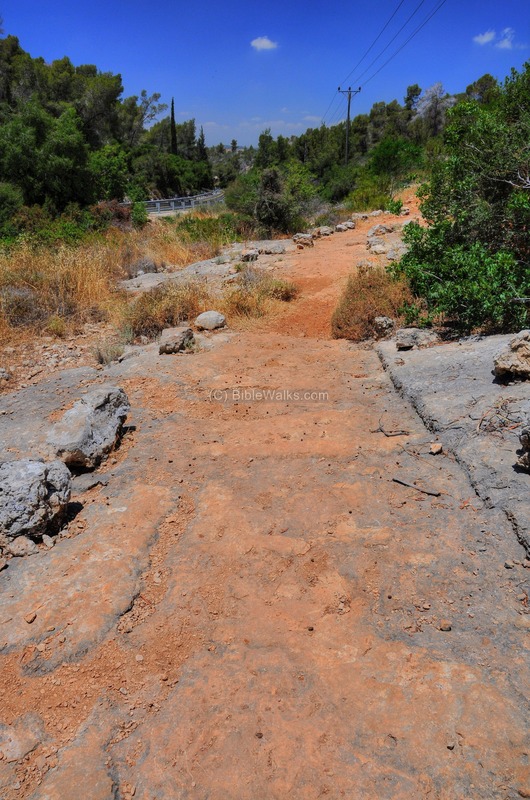 This road was part of the Roman road from the coast city of Ashkelon, via Beit-Guvrin, to Bethlehem and Jerusalem. Sections of the Roman road, named "Caesar Way", can be seen along the modern road, carved into the rock. Inside the main structure of the site are remains of a Byzantine church and winepress. The mosaic floor inside the Church is covered by protecting sand, and you can wipe the sand off to view the beautiful floor. A walking nature path (named "the Caesar Way") connects the site, on top of the hill, to lower sections of the Roman road. Milestones and a winepress are located on a lower west side of the walking path. Other ancient remains and springs are located in a valley north of the site - named "Kh. Matta" - and described in another page. All in all, this amazing area is a great place to spend a half day in a sunny weekend. 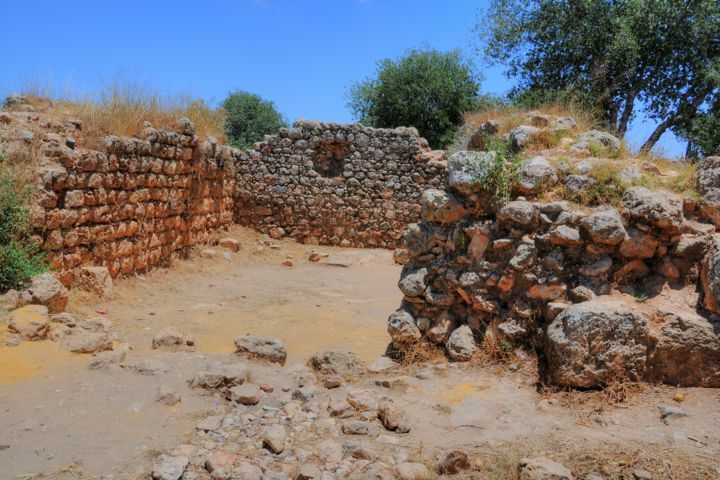 The site of Horvat Hanut is located on the low hills west of Jerusalem, an area called Shephelah (the "low land") of Judah. It is easily accessed from a convenient parking place at the side of road #375 from Jerusalem to the valley of Elah. The following aerial view shows the points of interest. You can point on the yellow squares to navigate to the selected place within this page, or the page of Kh. Matta. The land around the site was part of the tribe of Judah. 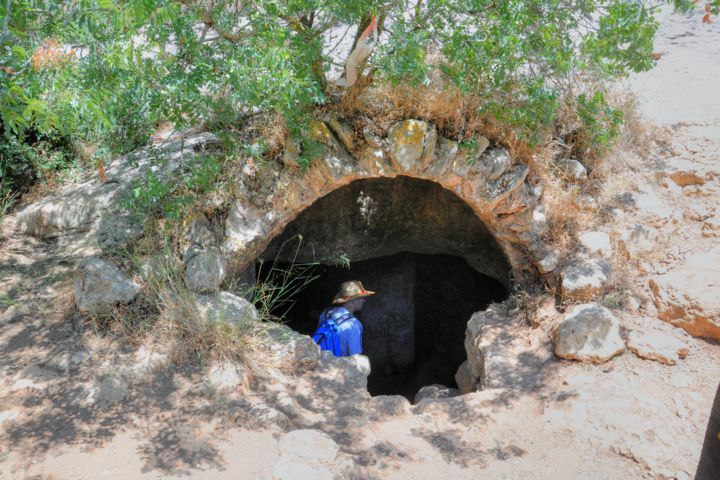 The most famous Biblical site is the valley west of this place, called the valley of "Elah", named after Terabinth trees that grow in the Holy Land. 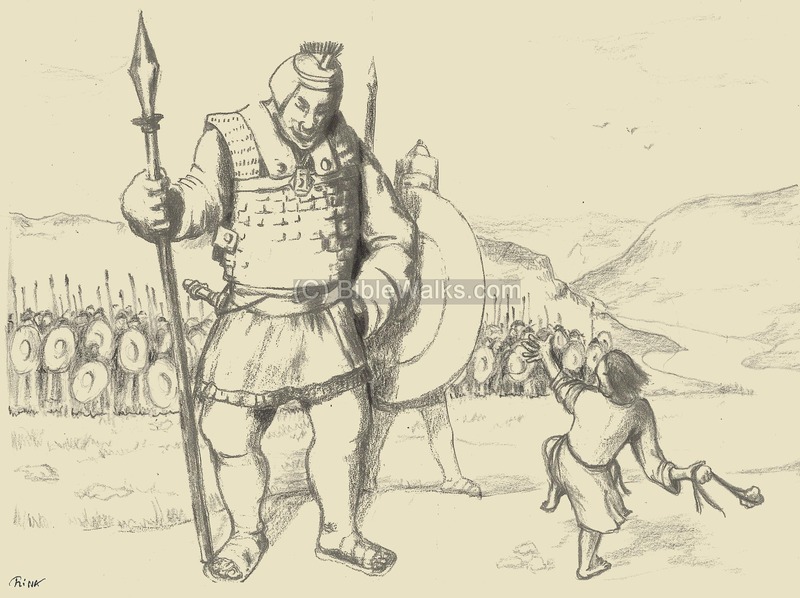 In the valley was the great battle between young David and the Giant Goliath, who settled the war between the Israelites and the Philistines by a single combat between the two champions of each side. (1 Samuel 17 1-4, 50): "Now the Philistines gathered together their armies to battle, and were gathered together at Shochoh, which belongeth to Judah, and pitched between Shochoh and Azekah, in Ephesdammim. And Saul and the men of Israel were gathered together, and pitched by the valley of Elah, and set the battle in array against the Philistines. And the Philistines stood on a mountain on the one side, and Israel stood on a mountain on the other side: and there was a valley between them. And there went out a champion out of the camp of the Philistines, named Goliath, of Gath, whose height was six cubits and a span." ... "So David prevailed over the Philistine with a sling and with a stone, and smote the Philistine, and slew him; but there was no sword in the hand of David". A Biblical map is seen below, indicating the cities and roads of those periods (Canaanite through Roman). 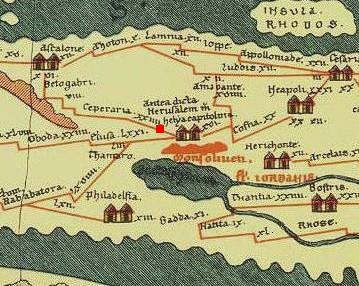 The location of Horvat Hanut is indicated as a red square in the Biblical map below. The valley of Elah is located to the left (west), and the battle of David and Goliath is near the location of Socah. 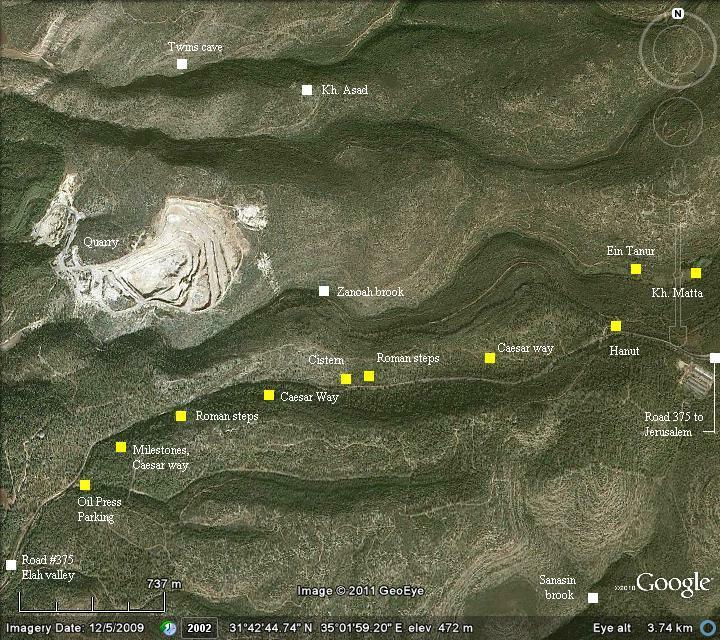 Notice the dashed line of the ancient road that ascends from the valley of Elah to Jerusalem, passing at the site. This road connected the coast to Jerusalem and Bethlehem. 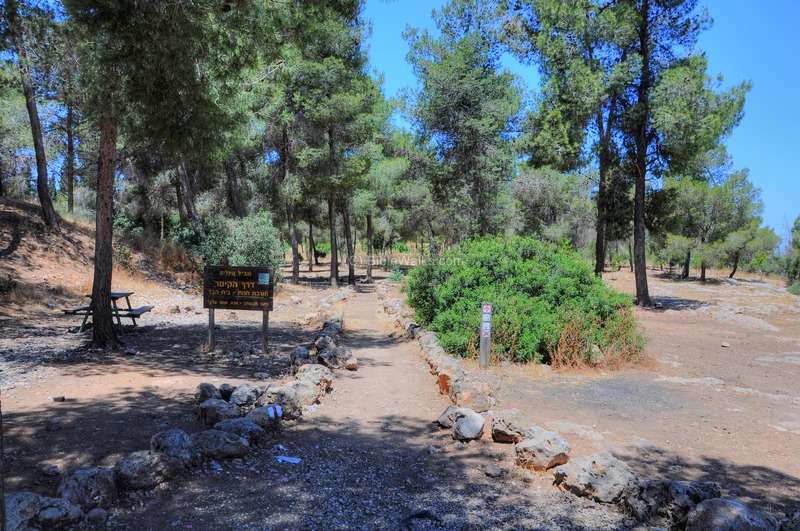 One of the major Roman roads from Jerusalem to the coast passed through Horvat Hanut, following the path of Biblical way. The Roman road on this section is part of the ancient road from Ashkelon, a large Roman port city on the coast, to Bethlehem and Jerusalem. 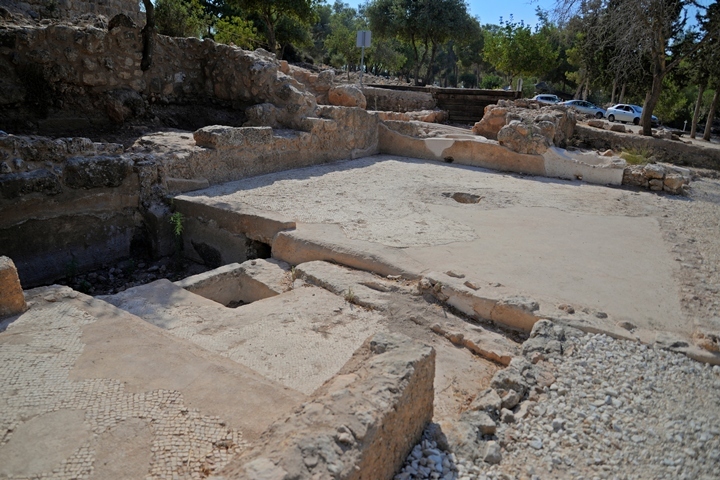 According to the excavator of the site, Eli Shenhav, the Roman road may have been in use during the Great Revolt against the Romans (66 to 73/74 AD). His assumption relies on Josephus Flavius's accounts of the Roman campaign to capture the nearby city of Gerasa in Judea, which was located at Khirbet Geres (Jurish), 4km to the east along the Roman road. Josephus wrote that Lucius Annius, under the command of Vespesian, went to Gerasa and slew its 1,000 young men (Wars 4, 9 1): "Vespesian"..."at Jericho and Adida"..." also sent Lucius Annius to Gerasa...". The archaeologist also unearthed in the ruins of this fortified village remains of the Roman siege. 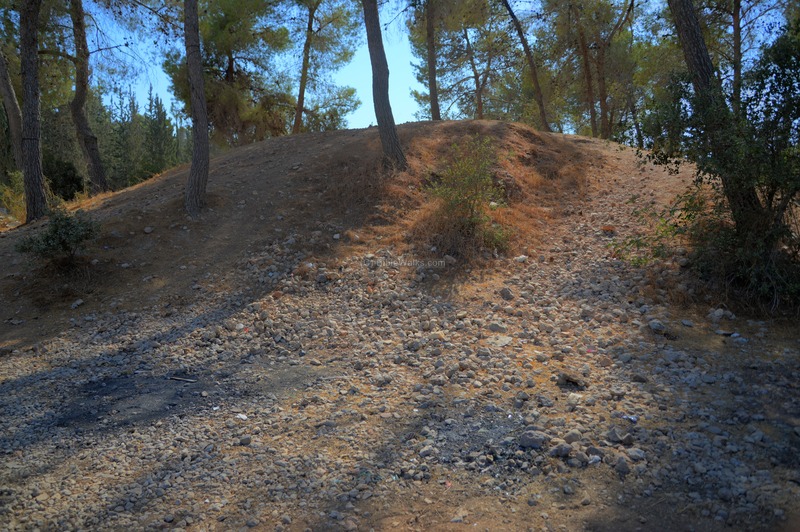 Thus, General Lucius came from the Roman camp at Hadid (north of Emmaus) via this Roman road. 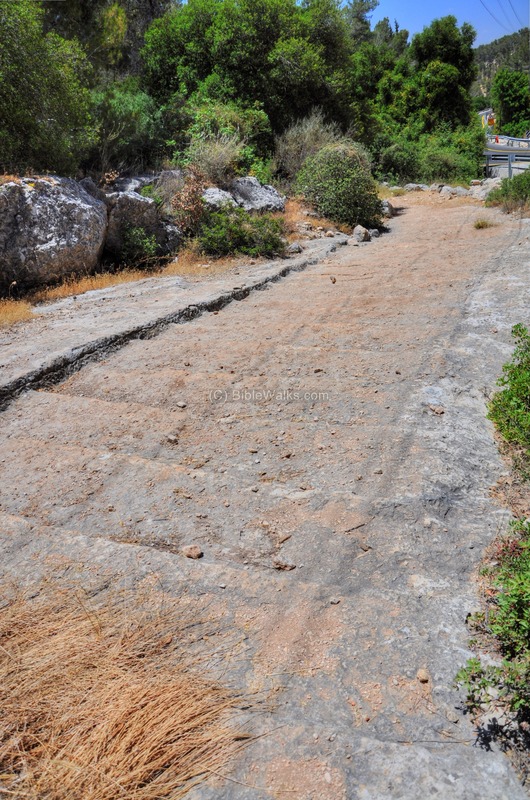 The Roman road was repaired and enlarged during the campaign of the Roman Caesar Hadrian, who crushed the second Jewish revolt against the Romans - known as the Bar Kochba revolt (132-136 AD). This date of the construction is not certain, and relies on the inscription on a milestone found along the road. 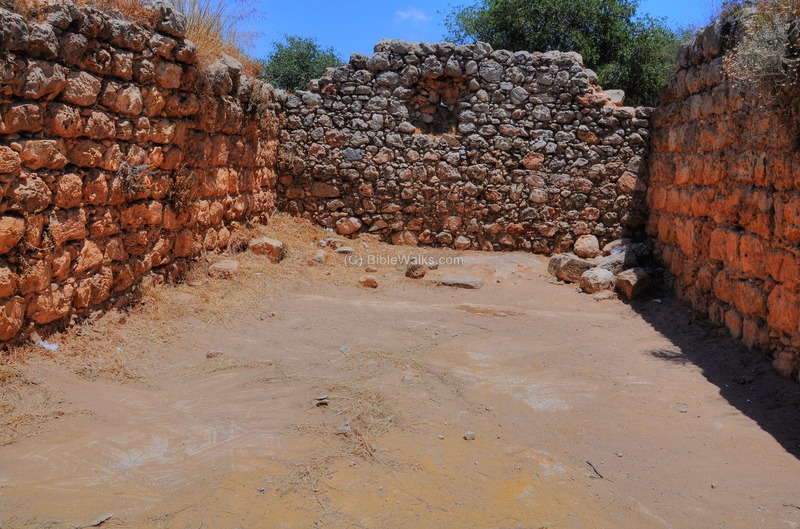 Bar-Kochba and his troops made their last stand against the might of the Roman forces in Betar, a fortified village which is located just 8 kilometers east along the road. There is an important document that illustrates this road at the 4th century. The Peutinger Map (Tabula Peutingeriana) is a medieval map which was based on a 4th century Roman military road map. The map shows the major roads, with indication of the cities, and geographic highlights (lakes, rivers, mountains, seas). Along the links are stations and distance in Roman miles (about 1.5KM per mile). The roads are shown as brown lines between the cities and stations. In the section shown below is the area of Jerusalem, drawn in a rotated direction (Egypt on the left, the Mediterranean sea on the top). Jerusalem is illustrated in the center as a double house icon, which represents a major city. It is listed as "formerly called Jerusalem, now called Aelia Capitolina" (antea dicta Hierusalem n(unc) Helya Capitolina). 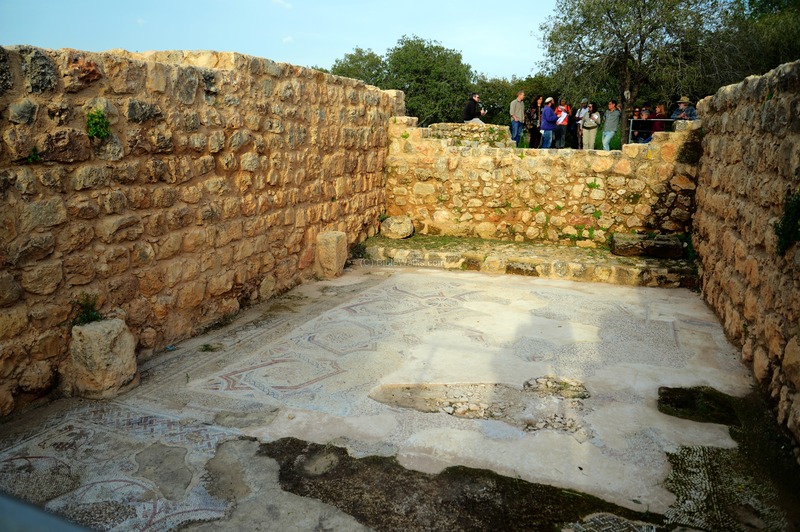 During the following Byzantine periods (4th-7th century), the road was used by the Christian Pilgrims to the Holy Land, and a Church was constructed here in order to provide roadside services. The mosaic floor was found on the floor of the main structure at this site. Its inscription is dated to the 2nd half of the 6th century. The Church was destroyed in the 8th C, probably as a result of the major earthquake of 736 AD. The site was later used as a station for the Ayyubid and Mameluke armies (12-14th century), but then deserted and remained in ruins until the modern period. Victor Guerin, the famous French early explorer of the Holy Land, visited the site in 1863 and described the Roman road and the ruins of the Khan. He reported on ruins of 10 small houses and two larger structures with 1m wide walls. 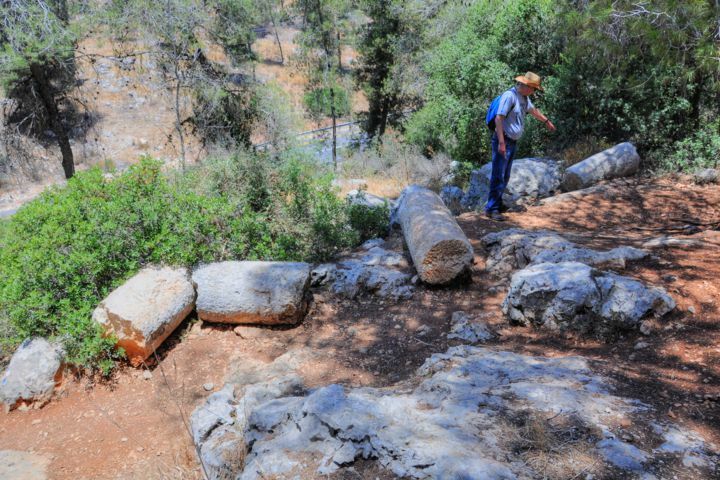 Guerin also relates a huge rock pile near the ruins as the traditional site of the grave of the Biblical Giant Goliath, who lost to David in the nearby Elah valley. According to the tradition, pilgrims who passed at the site threw three stones above the pile. The stone pile, 7m high and "52 steps" (9m) in circumference, is made of small stones, and is located near a large rock-hewn pool which can be seen today near the road. The area around Horvat Hanut was later examined in the PEF survey (1866-1877) by Wilson, Conder and Kitchener. This area appears in the center of the section of this map of 1878, and appears on this map in its Arabic form - Khurbet el Khan (marked with a yellow square). Their report on this site was very short (Sheet 17, p 104): "A few heaps of stones by the main road." The road passing thru the place is marked as double lines with a title of "Roman Road". Another section of a Roman road is also seen on the top of this section, passing thru the fortified village of Beit-Atab, and reaching Beth Shemesh. Both Roman roads join at Kh. Hubin, east of Horvat Hanut. 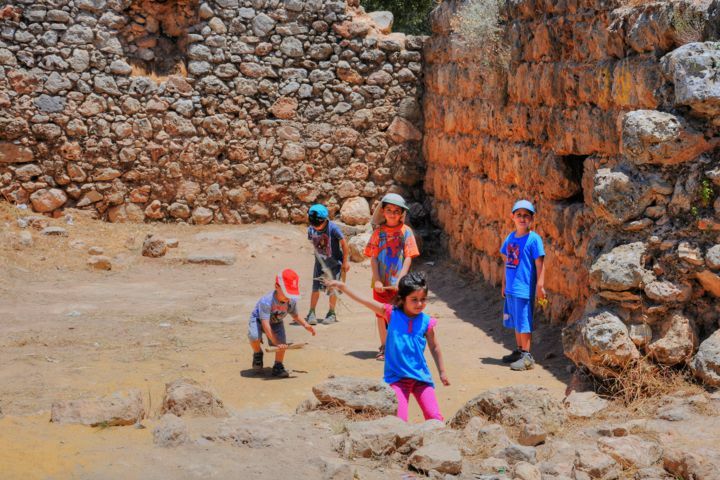 Excavations were conducted in 1985/6, headed by E. Shenhav (KKL) and S. Godovitz (IAA). 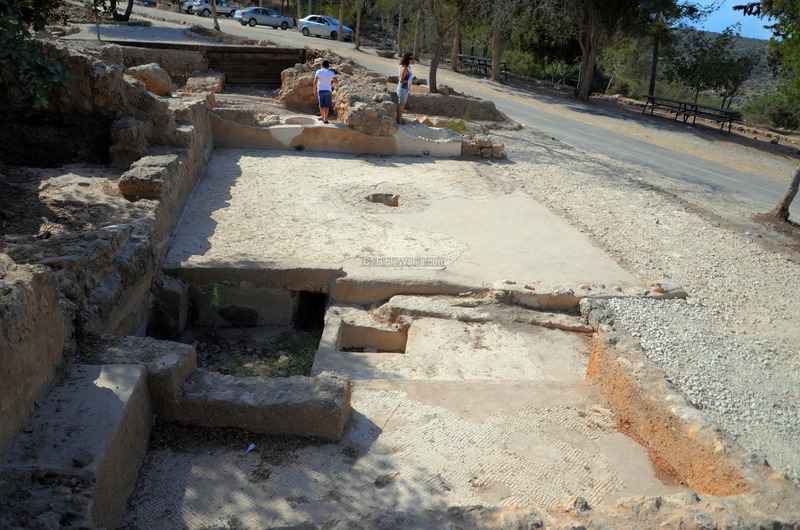 The team focused on the main structure, and found it was constructed over the remains of a Byzantine Church. 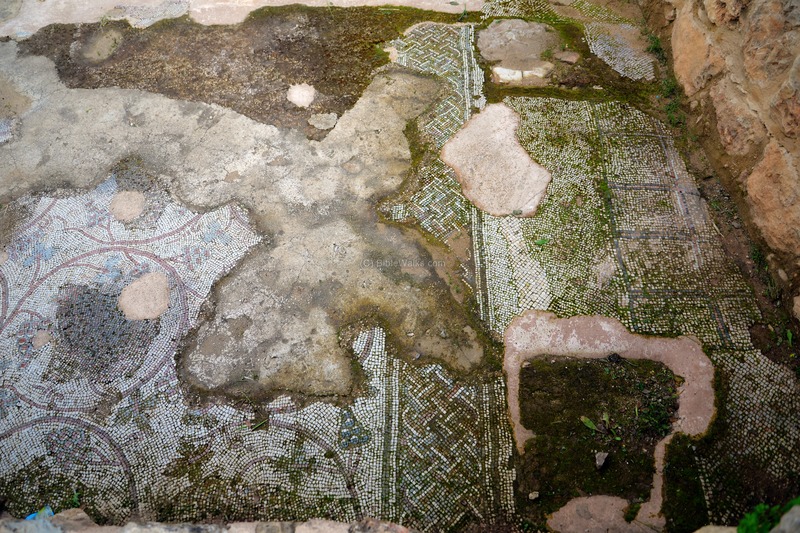 In 2012 the mosaic floor was badly damaged by religious extremists. This led to a restoration project which is still in process (2017). The KKL also converted the west of the ruins to a day/night public parking place. Horvat Hanut is located close to the modern road, and is easily accessed from the parking lot. A group of ruined houses is seen around the central structure, which was once a Byzantine Church. In the north side, seen here in the far background, is the valley of Zenoah. The central structure has three standing thick walls. The southern wall (right side) is 1.8m to 2.5 wide, and was part of the 6th century Byzantine church. The northern wall (left side) was attached to the Byzantine wall at a later date (Ayyubid period, 12-13 century). The crude eastern wall (background) and missing western wall (foreground) are 0.8m wide and were constructed during the Mameluke or Ottoman periods (14-19 century). The floor of the structure was initially covered by a high level of debris. After cleaning the mess, the archaeologists then removed another 10 cm of a grey layer, and 1-2mm of a scale deposit (as a result of exposure to rain). 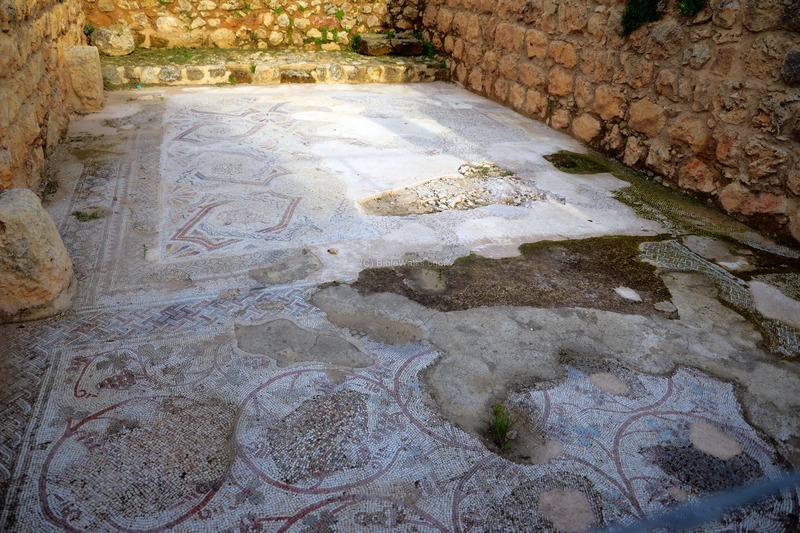 After cleaning up the debris and layers, a magnificent mosaic floor has been reconstructed. Its size is 10m x 4.25m, and is based on 1x1 cm stones. 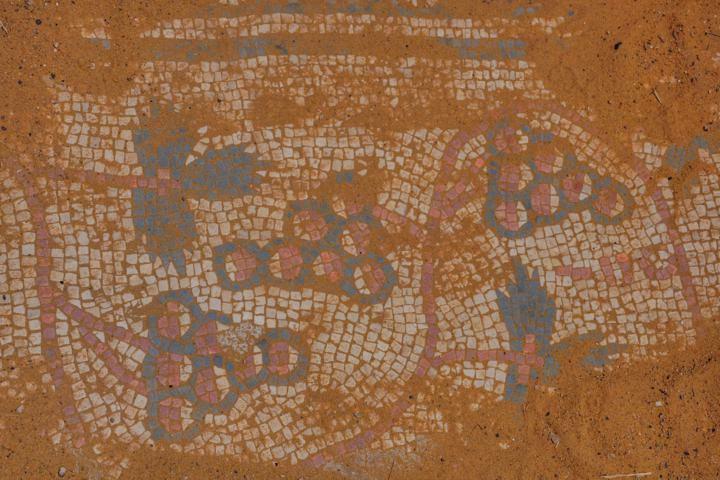 It illustrates colorful geometric forms, grapes, icons of animals, and Greek inscription. The section below is from the western side, which is the earlier floor. The carpet is decorated with grape vine that forms rows of 5 medallions. The floor is now covered by sand, placed over the floor in order to protect it. After wiping the layer of sand off the floor - sections of the floor are exposed. A section of a geometric form and inscription, seen below, is located on the eastern side of the church. In addition to the inscription on its edge, the eastern floor is composed of 12 hexagon shapes, arranged in 4 rows of 3 hexagons each. Another section of the Greek inscription is seen in the next photograph. It is 4m long by 36cm wide (including the frame), and is composed of 2 lines with 7cm high letters. 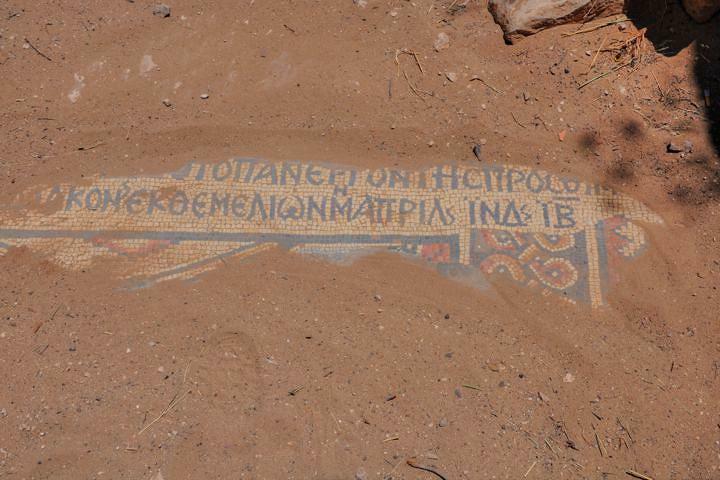 The inscription bears the name of a certain "Theodoros", who was the head of the Monastery at the time when the eastern floor was laid in the 6th C.
The date written in the inscription is "...in April on the 12th (year of the) Indiction". This date may be 549AD, since year 1 of the first Indiction was 537AD (the date Justinian decreed that all Byzantine dates must include the Indiction). Note that Shenhav suggests it to be 15 years later or more, since the Indiction restarts every 15 years. 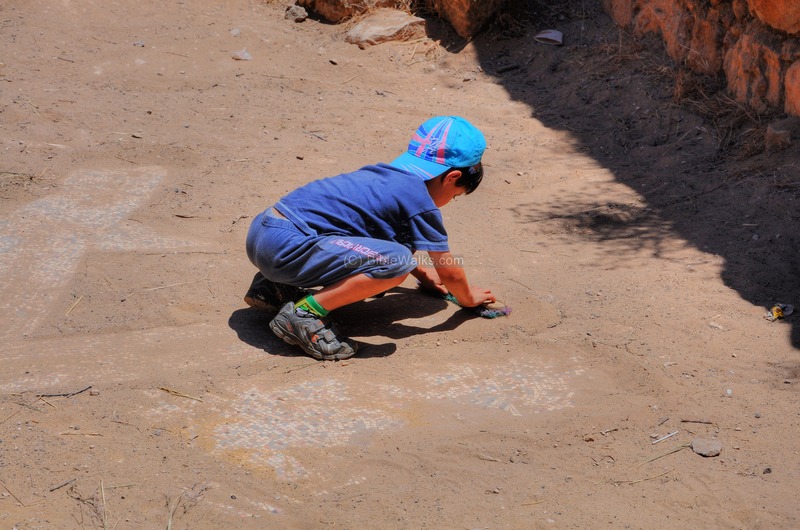 The children who come here to the ruins enjoy the "game" - wipe the sand off the mosaic floor and find out what's under it. A broom helps to brush away the sand. This is indeed a unique "playground", a sort of treasure hunting. The kids love it... and in the process they learn to appreciate history. 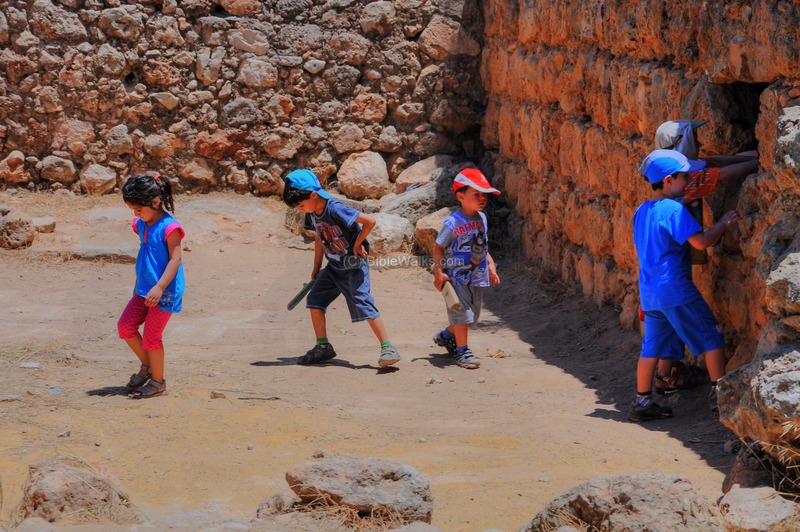 Who knows - perhaps they are the future archaeologists? In 2012 the mosaic floor was badly damaged by religious extremists. A preservation project returned it back to its original condition. The floor inside the structure is now enclosed inside a protected area. Some of the sections of the floor are in a bad shape. The Greek inscription was removed in order to safeguard it. A NW section of the floor is below. The icons of the animals were purposely damaged during the Byzantine iconoclastic period. The apse of the Church was not yet found. Perhaps, it was located to the east of the structure. However, behind the rear side of the eastern wall the excavators revealed an entrance to the Crypt. 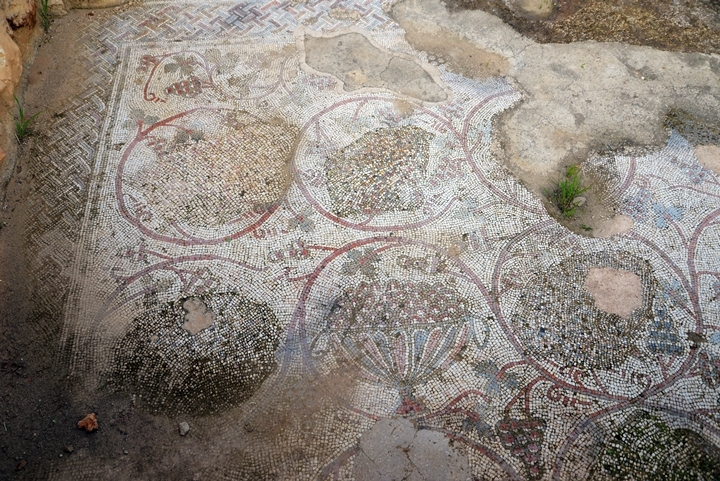 The area around the entrance was paved with mosaics. Bases of two arches are located on both sides of the entrance, indicating that this section was covered by a roof. Steps lead down into the narrow chamber of the crypt. Its dimensions are roughly 1.8m in height, 2.5 x 2.5m in area. Inside the excavators found evidence that a single sarcophagi or coffin was once located there, as indicated by its negative imprint. Fragments of bones were collected on the wall south of the crypt. 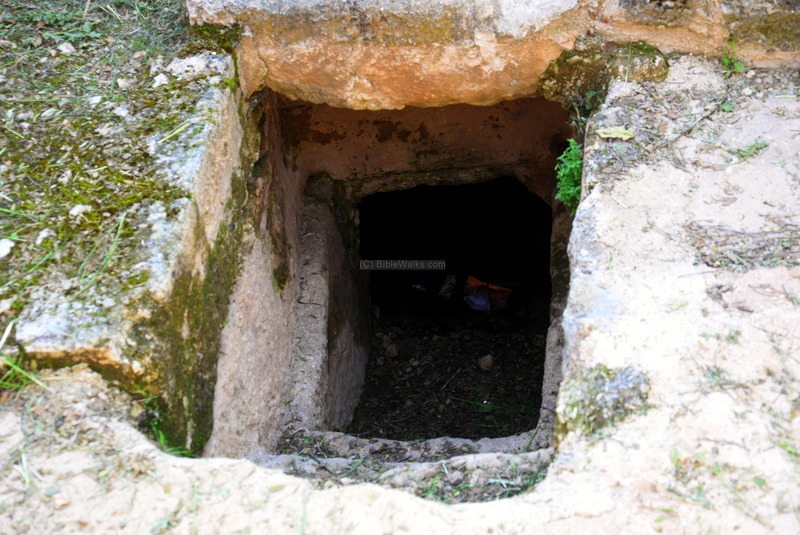 They were removed during the Mameluke period, as the crypt was converted to a storage place. The bones, belonging to an adult male, were too small to be able to be dated. 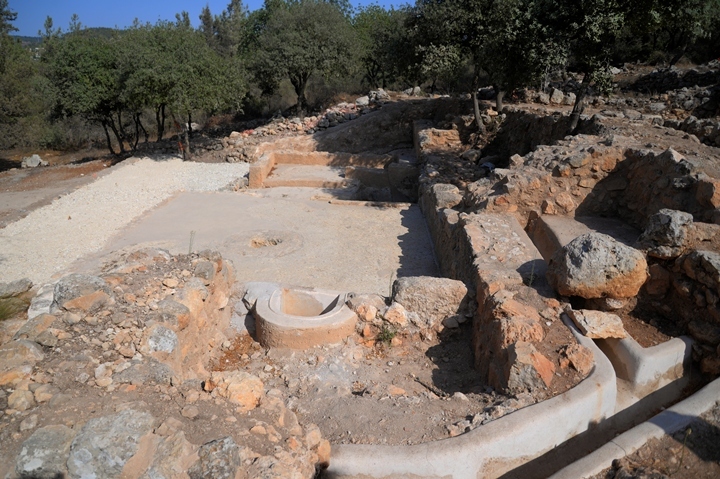 A Byzantine period winepress is located on the northern (lower) side of the Church. Winemaking was one of the sources of income of the monastery. This large winepress, 14.8m by 8.0m, is composed of 3 levels. On the top level, the floor is paved with white mosaic. On the 2nd level is the large treading floor, where the workers crushed the grapes with their feet. Then, the juice was left on the floor and inside the side chambers for a preliminary fermentation. In the center of the treading floor is a hole, which served for secondary crushing of the grapes. The crusher used a single fixed-screw press. The press squeezed out the must left in the grape skins and stalks after treading. After the grape juice fermented, it was channeled via a filter into a covered collecting pit, 1.75m deep, where the juice was collected. Inside the pit, the secondary fermentation took place. After the process was completed, the wine was then collected in jars and kept in a cool covered area. 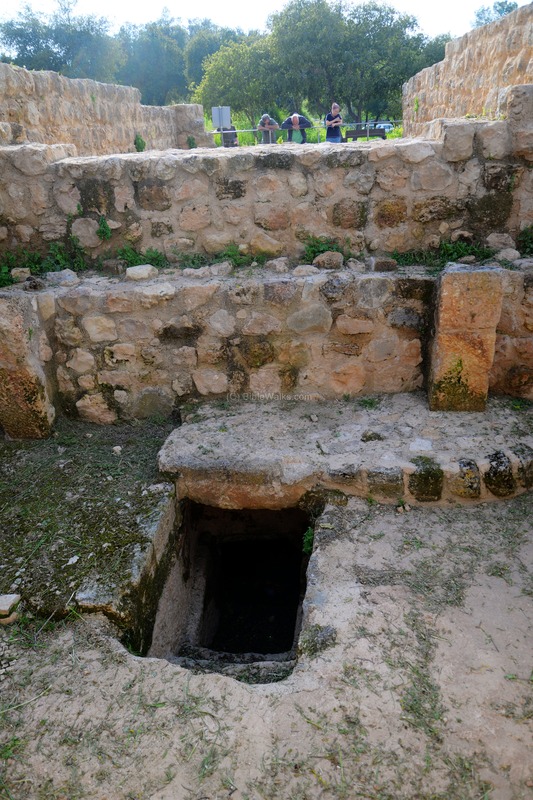 A water channel bypasses the winepress from the top and west sides, as seen in the bottom of the view below. It probably served as a drain from the church, conveying the water or sewage down to the valley. (d) Horvat Hanut - Cistern and "Goliath's grave"
A large water reservoir is located on the side of the modern road, near the entrance to the "Caesar Way" path. 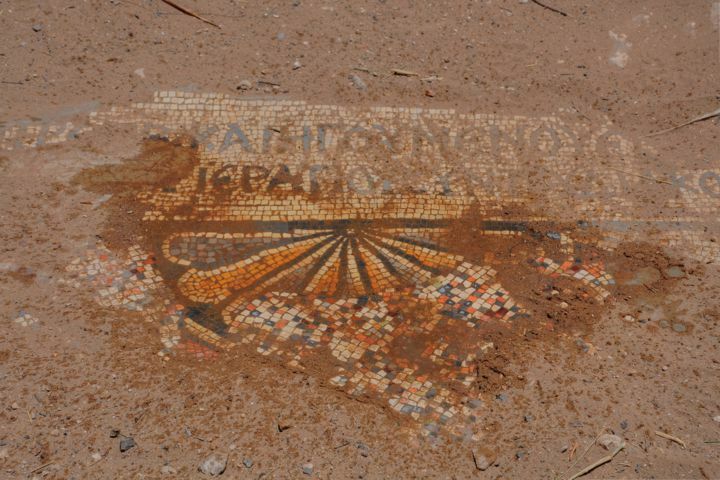 It was recently cleaned, as part of the restorations in Horvat Hanut. It is dated to the Byzantine period, and was the primary source of water for the roadside inn. The pool area is 6.5m wide and 12.5 long. The reservoir was longer in Byzantine time, but it now ends on the eastern side. The side walls are made of large stones, with smaller ones and cement filling up the gaps between the slabs. The walls were then covered by plaster in order to seal it. A large stone pile is located behind the pool, seen below. Its size is 7m high and 9m in circumference, and is made up of small stones. According to Byzantine tradition, this huge rock pile is the traditional site of the grave of the Biblical Giant Goliath, who lost to David in the nearby Elah valley. According to the tradition, pilgrims who passed at the site threw three stones above the pile. 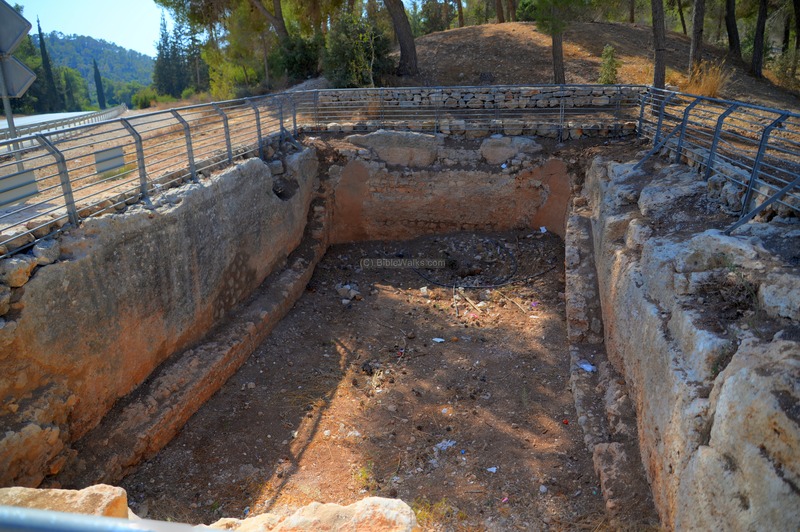 The pile was probably made of the ground that was extracted while building the cistern, but why argue with tradition? The sign near the cistern shows the entrance to the "Caesar Way". The remainder of the photo section describes the highlights along the "Caesar Way", walking westward down the hill. 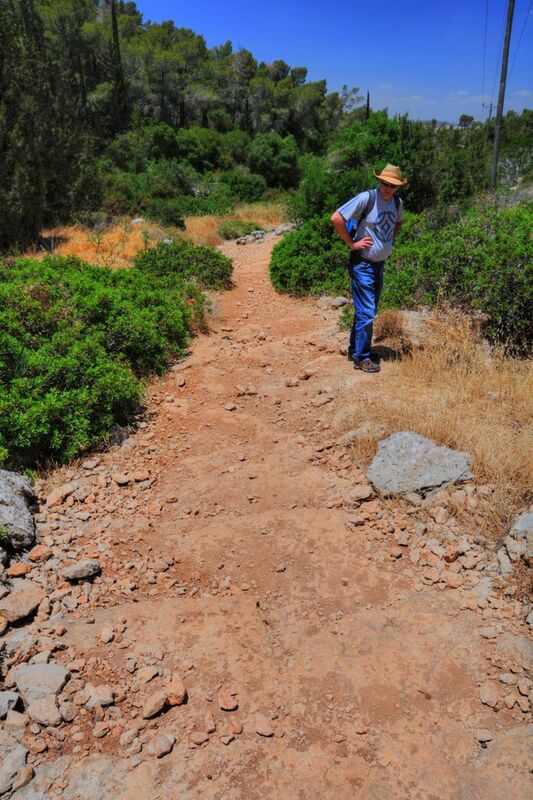 The "Caesar way" path leads from the top of the hill, where Horvat Hanut is located, down towards the parking area near the oil press. This nature path traverses the forest and reaches an open area where the ancient road is visible. It is part of "Israel's National Trail". Large steps are carved into the flat rock. This is where the Roman road passed on its way down to the Elah valley. Another view of the section. The modern road at this point is located on the south (left) side, but then the path moves to the other side of the road after 1.5km from the start of the path. 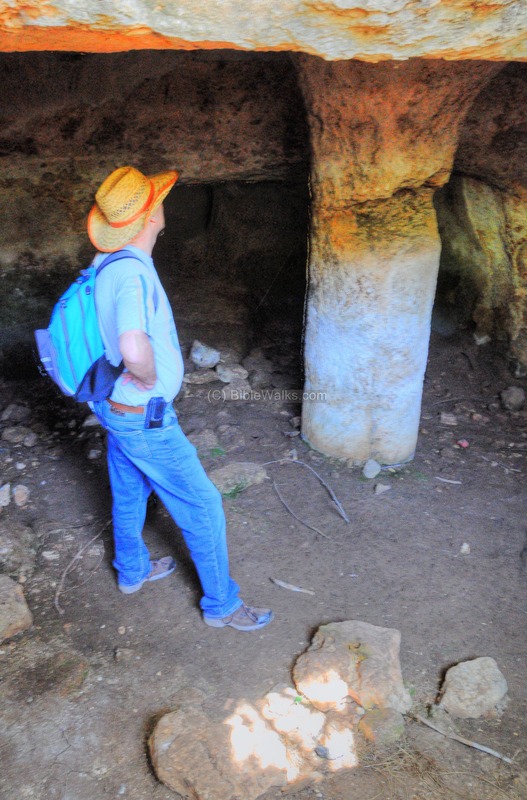 Just before crossing the modern road to the other side, there is another ancient installation - a water cistern. 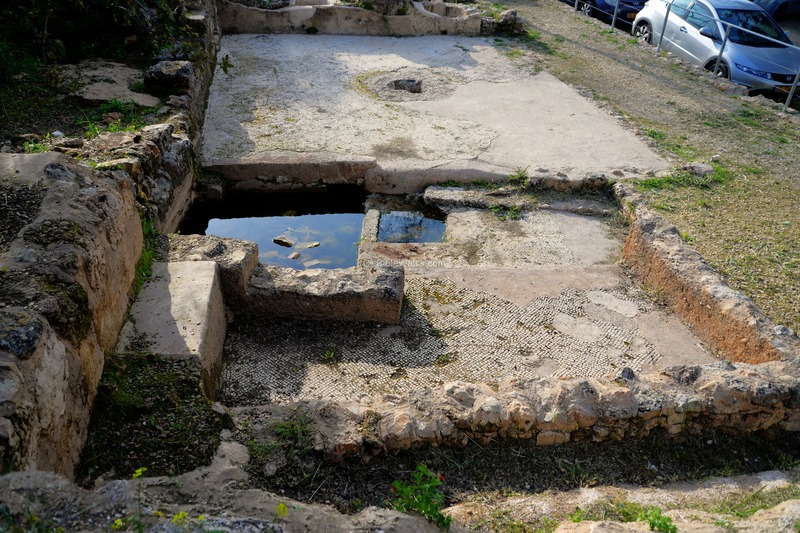 The cistern, with a column in its center, is a water reservoir. It collects winter rainfall water and supplied drinking water for the men and animals who used this road. The path continues on the south side of the modern road. These pictures were captured during the beginning of the Summer (June 2011). 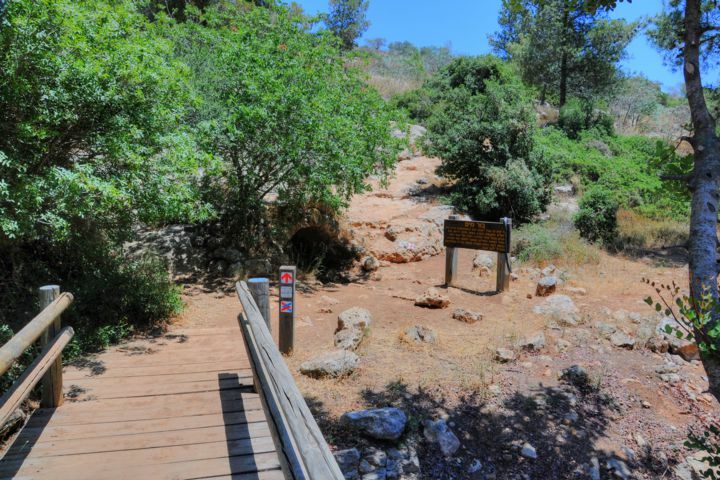 It is yet relatively pleasant at that time, but gets hot during the summer, although most of the path is shaded by the trees - pine, oak, Elah-Mastic (Pistacia lentiscus) and more. There are rock carvings along the path, which were either part of a stone quarry, or foundation of a structure which was part of the Roman road. 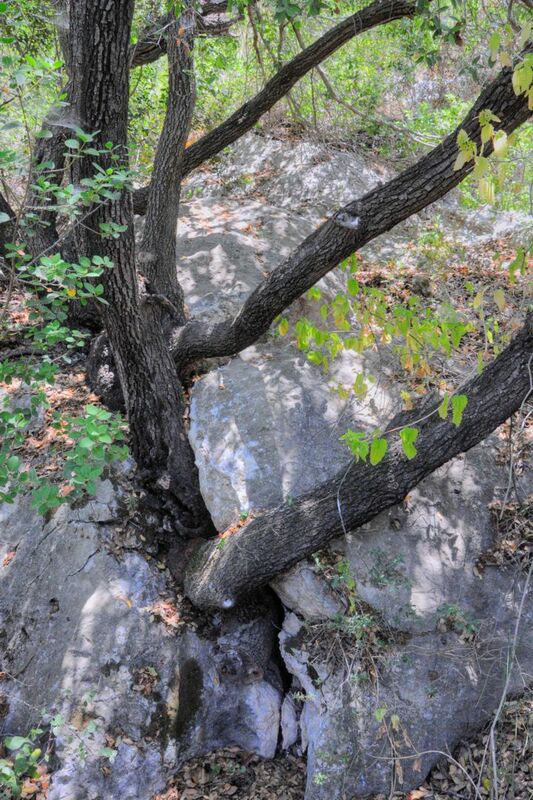 There are also some fascinating scenes of the trees drilling down into the rocks. 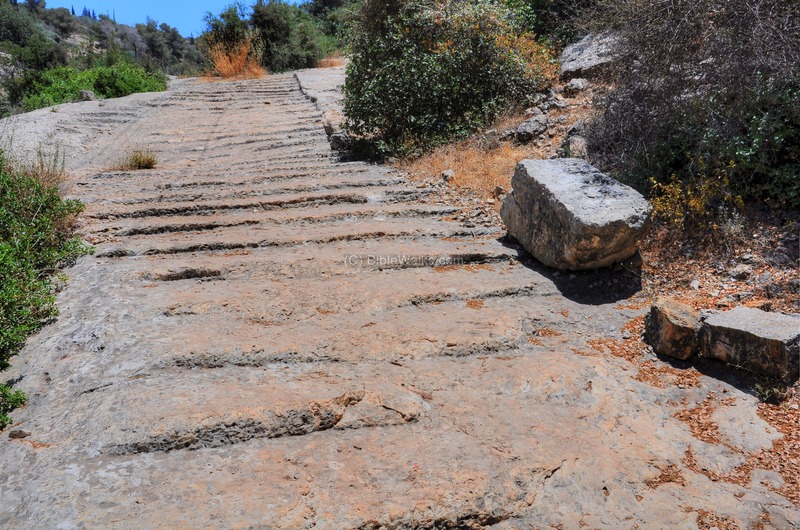 Another section along the "Caesar Way" is one of the most beautiful preserved Roman roads in the Holy Land. 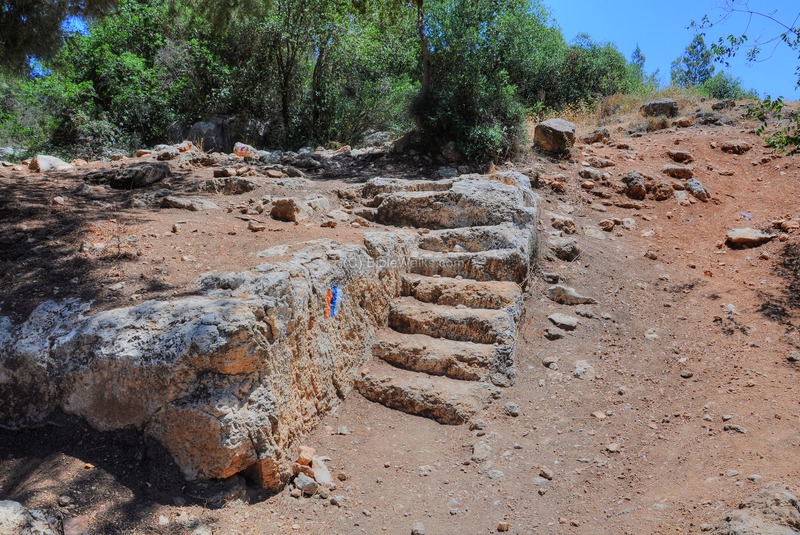 You can also see these steps while driving up the road #375 (from the Elah Valley to Jerusalem) and it will be on your right side. 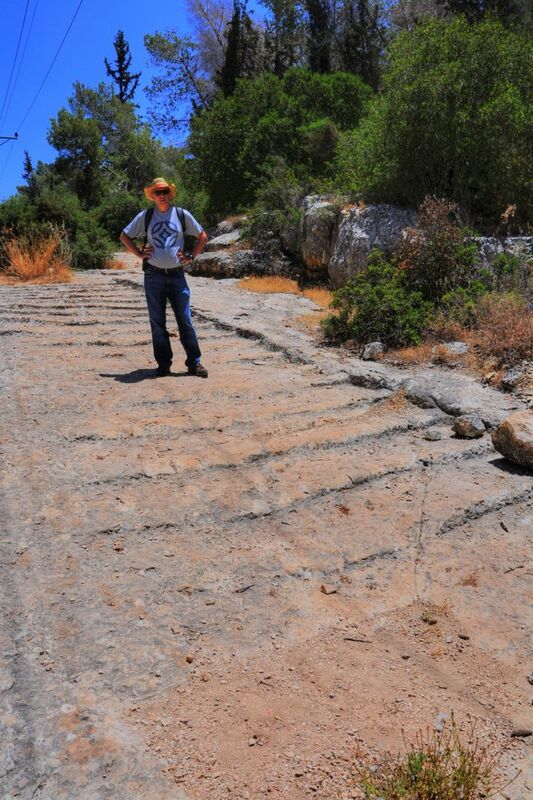 Tuvia is seen here standing above the steps, which are hewn into the flat rock. 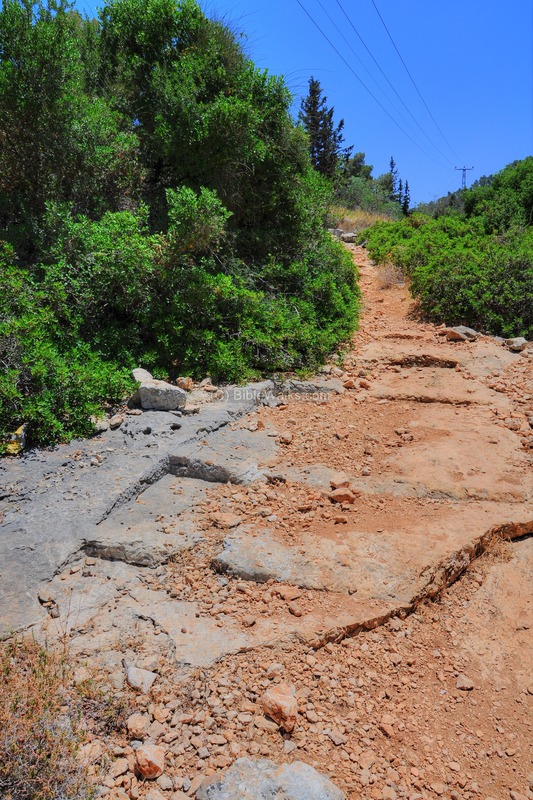 The purpose of the grooves may have been to prevent the carts from slipping down the slope of the road, and in the opposite direction - made it easier to climb up the road. Alternatively, there might have been another layer above the grooves, and their purpose was to hold that layer. Continuing along the path, you will reach to a group of Roman milestones. The milestones are scattered around, lying on the side of the path. 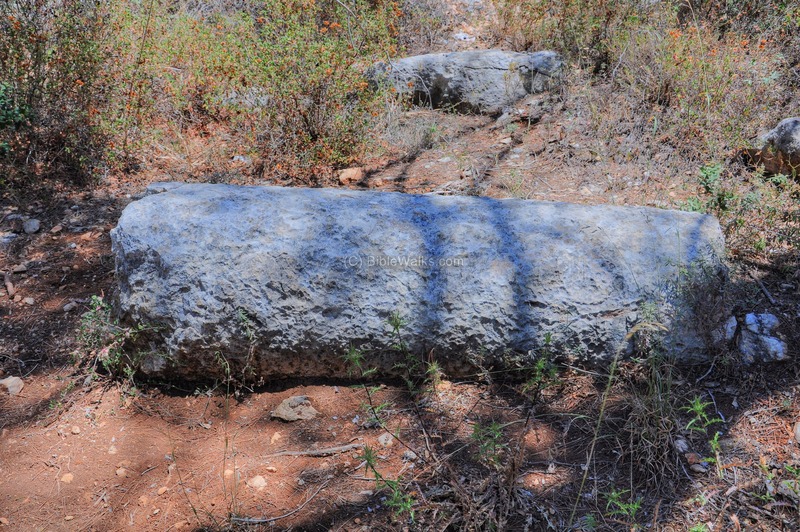 Roman milestones are usually inscribed with Latin or Greek inscriptions, and in most cases bear the name of the Caesar, the road name (in this case - Ashkelon to Jerusalem), the position or range along the road, and an optional blessing to the Emperor. In these group of milestones there are no visible inscriptions - perhaps they appear on the hidden side. 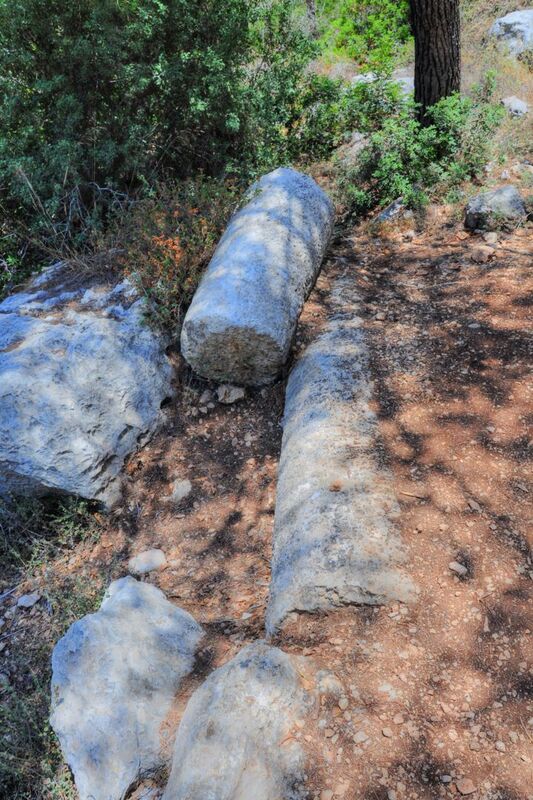 Inscriptions found on other milestones along this Roman road attribute the construction to Caesar Hadrian, who crushed the Bar-Kochba revolt (132-136AD). 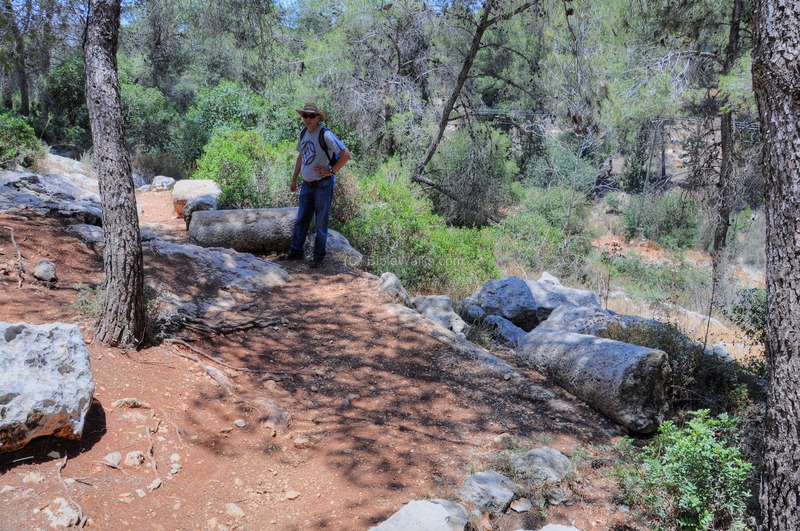 Other milestones of this Roman road (Ashkelon to Jerusalem) are located southwest of the valley of Elah (Click here to go to that web page). They bear inscriptions of Septimius Severus (145AD – 211AD), who may have also repaired this section of the road. 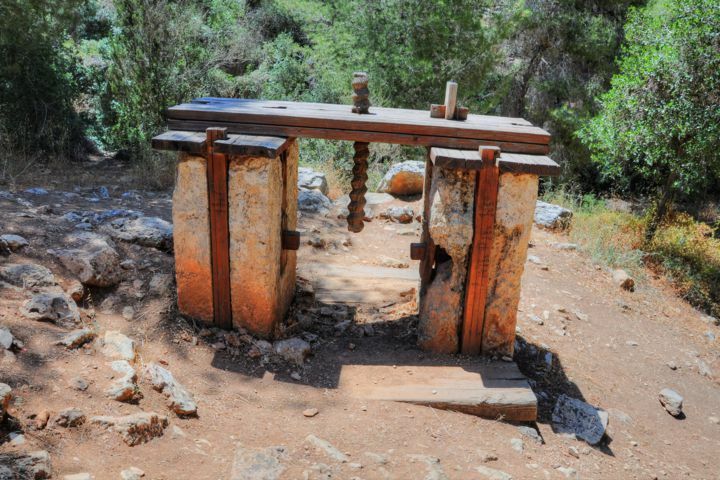 A reconstructed oil press is located at the lower end of the path. This type is known as "screw with direct pressure" (type #7), which is the second step in the process of oil production. In this oil press a vertical screw was fixed inside a stone or wooden frame. The screw was turned around with a short handle, which pushed down a crushing stone on a number of baskets filled with crushed olives, against a basin. The juice flowed out from an outlet into the collecting vat. (You can read more about oil presses). Stairs lead from the parking to the oil press installation, as seen below. 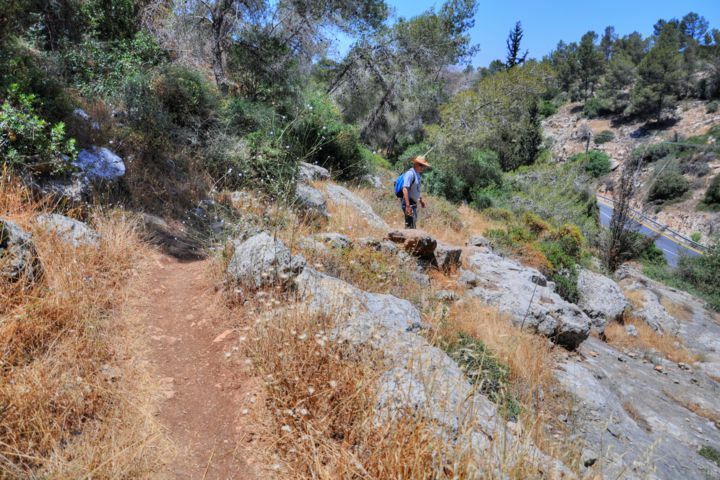 The 3-stripe color marking (orange, blue & white) indicates that this path is part of "Israel National Trail" (Shvil-Israel) that crosses the Country from Dan to Eilat. It takes an average walking time of 45 days from side to side. 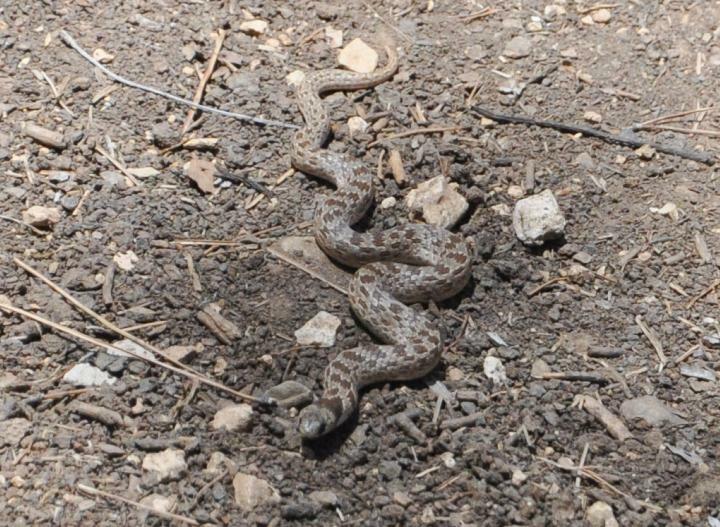 A small snake crawled slowly along the path. After all - this is a nature path and snakes are part of nature. This snake is a Eirenis-Coronella (Shalvon Ktamim, of the family Colubbridae - Za'aman), who hunts and eats scorpions. Although this one is not poisonous, it's important to walk with closed high shoes and always watch your step. (Thanks to Benjo of the web site snakes.co.il for the identification). Hanut, Hanot - Hebrew - parking place. Based on the Arabic name. 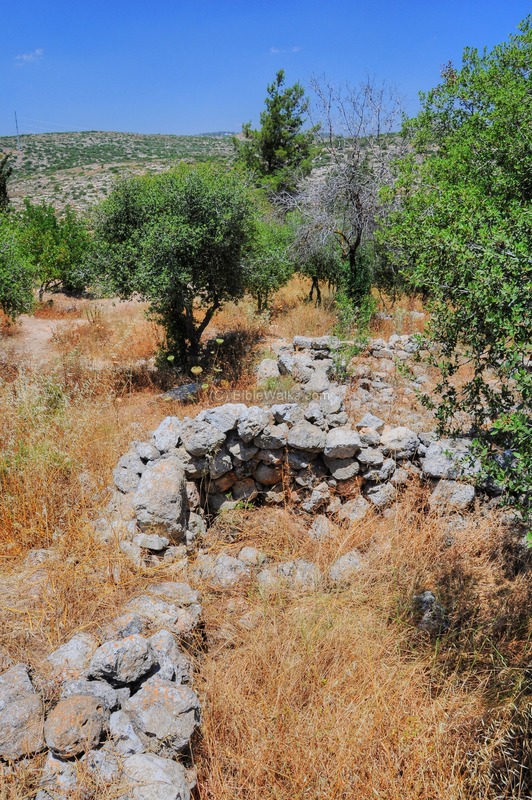 Horvat (Khurvah, Horvah, Horbah)- Ruined site in Hebrew; Khirbet in Arabic. Biblical references: Leviticus 26,31: "And I will make your cities waste,...". Isaiah 44, 26: "...and I will raise up the decayed places thereof. el Khan - Arabic name of the ruins, means: "the hostel" - based on its function as a station along the road. Beit Guvrin - Aramaic - Beit (house) Guvrin (men), "House of the men"